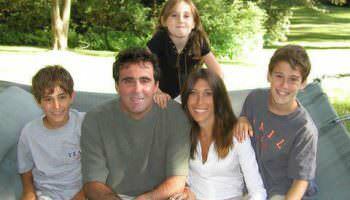 The Guz family in 2002: Liz and Brian and children, Michael, 10, David, 12, and Lauren, 7. First, the Guz family formed the Michael Guz Memorial Fund in conjunction with the Heinz C. Prechter Bipolar Research Fund at the University of Michigan Depression Center. The goal of the fund is to find genetic solutions for individuals with bipolar disorder and help them live better lives. Bipolar disorder is a medical condition caused by a chemical imbalance in the brain and marked by significant changes in mood, thought, energy and behavior. Knowing you have a choice and making the choice to do something while grieving is an incredible struggle,” Guz said regarding moving forward. “I am a very private person, but knew I wanted to help others going through this struggle. In order to raise funds and awareness, ELLA Designs was born. Article originally published at C&G. Click image to view larger. Elizabeth and her daughter, Lauren (taking the first two initials of each of their names) had a vision to create a business where they would make beautiful jewelry while raising awareness and money for bipolar research. The ELLA Designs was created for the purpose of donating 50% of all proceeds to the Heinz C. Prechter Bipolar Research Fund. ELLA Designs offers original and unique jewelry. All of the bracelets and some of the necklaces are made with beautiful magnetic clasps making it easy to put on. “ I like to look for things that I like and would want to wear,” Guz said. “They are also extremely versatile and the bracelets can be added to each other to make a choker or longer necklace.” Many of the necklaces are functional as well as beautiful. There are working watches, magnifying glasses, whistles and lockets in addition to many other unique pieces. Having had success at shows and house parties, Guz is excited launch the online store at elladesignsjewelry.com. Guz feels this is the next step to growing the business knowing with every piece made a purchased 50% of all proceeds benefit the Heinz C. Prechter Bipolar Research Fund. “I see that slowly the negative stigma of people who suffer from mental illness being lifted, but we need to do more,” Guz said still with sadness and hope in her voice. “Just recently, she met with members of the Prechter research team at the University of Michigan Depression Center who are doing groundbreaking research to make treatment more tailored for the individual by testing stem cells and finding what medications will work best.” The research will save lives. The Guz family intends to continue to honor Michael’s death to help others who suffer with mental illness.